File management for Windows dominated networks. Is there a better alternative to WinShortcutter? Is WinShortcutter really the best app in File Management category? 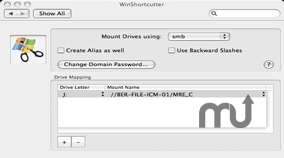 Will WinShortcutter work good on macOS 10.13.4? WinShortcutter is a collection of small and usefull utilities that are primarily focused at people working in a windows dominant office environment with a weak Mac support. Windows Domain Passwords can be switched using the WinShortcutter System Preferences. The finder context menu has a new menu item to copy filename paths directly into the clipboard. You can then paste the text into an email.